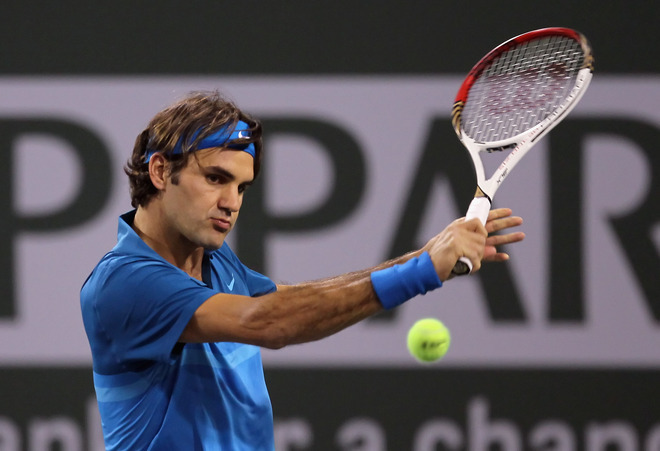 Roger Federer played his first match of the BNP Paribas Open in Indian Wells on Sunday night. There was heavy speculation following his fall in practice on Friday, as the Swiss maestro did not practice on the grounds either Saturday or Sunday. The rumors of withdrawal due to injury were put to rest when he walked on court to face Denis Kudla. The match was over in a hurry, as Federer raced to a 6-4 6-1 victory in just 57 minutes. The Swiss appeared pale and listless when he walked into the interview room, and there were reports he had suffered some stomach problems on court. Federer, a three-time Indian Wells champion, said he did have a fever. “It’s not a terrible temperature, but there’s something going on,” Federer said, attributing the illness to contact with his family and not a result of the intestinal virus. Federer will have to recover quickly from illness as he will face big serving Canadian, Milos Raonic, in the third round (Tuesday).